The Indo-British connection is a much misunderstood affair. There are Anglophiles and Anglophobes in India while in Britain there are patronising, if charitable, Raj lovers and plain India-bashers…The less-educated and over-educated among the Indians and the British have their typical hang-ups while there is a minority in the middle that feels misunderstood and laughed out of court by both sides. There is also a ‘diplomatic’ class in Britain and an outwardly ‘ever agreeable’ or chaploos class in India. Yet there is a genuine minority in the middle that is not afraid of openly defending the other side – Indians defending Britons and Britons defending Indians – be it at work, in the pub or outside in wider social life. For all the Anglophiles, Anglophobes, Raj lovers and India-bashers, the Indo-British encounters are akin to counterpoints in music, opposite yet complementary, giving a special note to the composite symphony…. 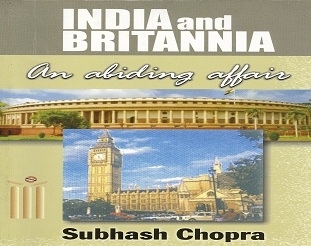 Review by Sir Mark Tully, writer, broadcaster and former BBC Bureau Chief, South Asia: A very important book… it’s extremely well written… Anyone who reads it, they will find they are getting through it with a great deal of enjoyment… I disagree with parts of it because I do believe that the empire and the Indo-British relationship should be seen from both sides… It’s very important to openly admit our differences and discuss these differences and I very much hope that this book will be the beginning of a new discussion between India and Britain. SUBHASH CHOPRA is a freelance journalist. He began his journalistic career at The Indian Express, New Delhi. After about four years on the reporting and editing staff of the Express, he left for Britain where he worked on newspapers up and down the country for about 25 years, including TheTimes, London, at its business news desk. He also had a short spell as Publications Editor, Commonwealth Secretariat, London. In India, besides working for The Indian Express, New Delhi and Madras, he worked as Associate Editor, The National Herald, and Asian News International, the print and television news agency, looking after its scripts for Reuters and other feeds and the print service for newspapers. He has been freelancing since leaving ANI and now divides his time between New Delhi and London. Diabetes awareness & education camp in Dwarka on 15th Nov.